Gonna calm this crisis down. Who would have thought it? 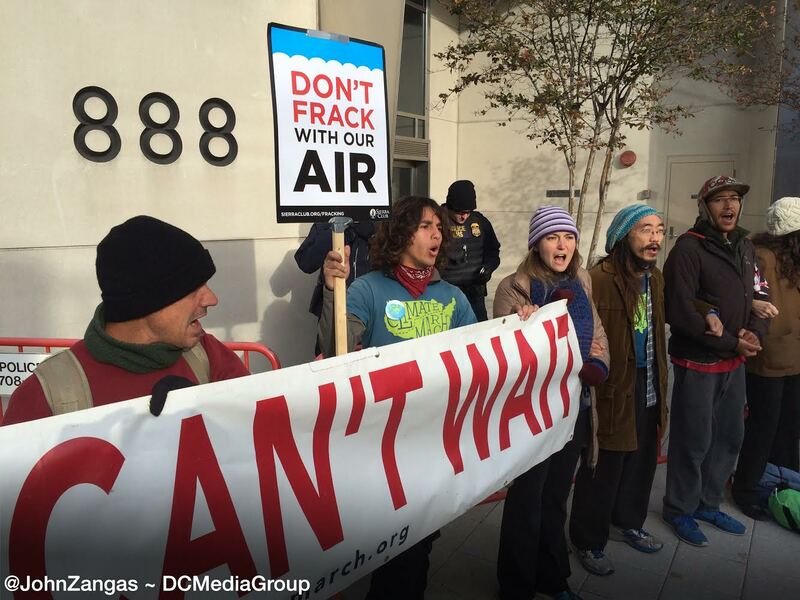 On Friday morning, November 7th, for 2 ½ hours, the determined and courageous nonviolent activists of Beyond Extreme Energy shut down the DC headquarters of the Federal Energy Regulatory Commission, FERC. All three entrances to the building were successfully blockaded, and virtually no one was getting in. 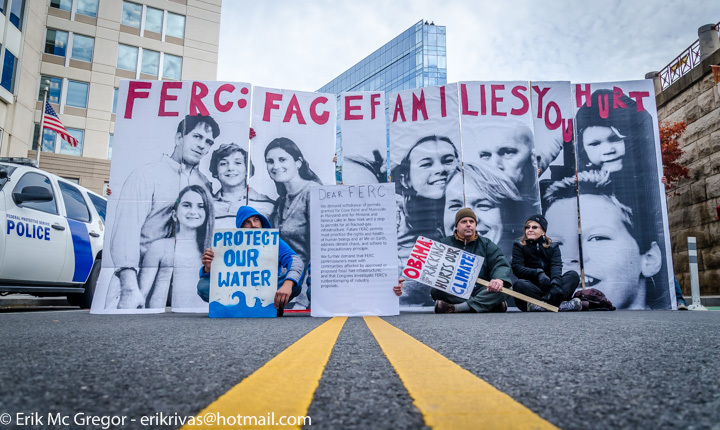 By 9 am there were about 150 FERC employees massed on the sidewalks in front of FERC, waiting for the police to clear away five fracking fighters who had successfully locked down at 7 am with lock boxes across the driveway into the FERC parking garage. 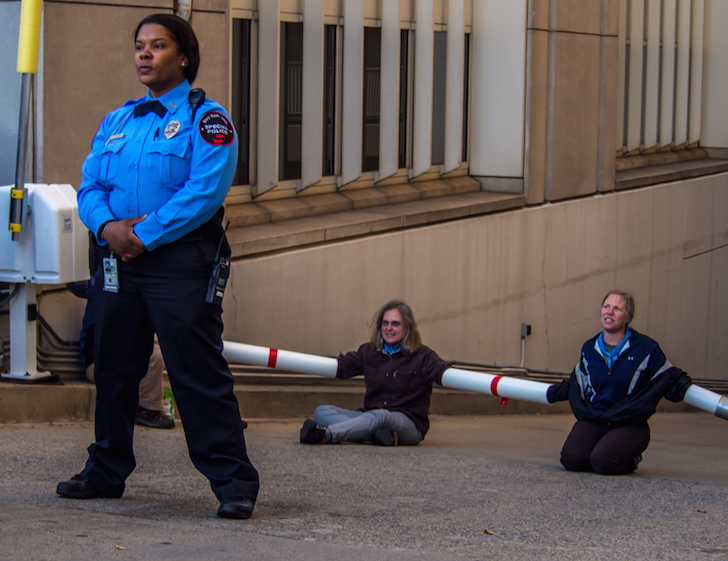 The driveway had been the route used by police to funnel FERC employees into the building for the four days previous when BXE activists had successfully blockaded the two pedestrian entrances. For short periods of time during those four days, no more than for maybe 20 minutes at a time, we had been able to prevent pedestrian use of that driveway (we prevented car use for the entire week). We did so by forming a long enough line of people to prevent anyone getting through, until the cops moved in and made arrests after their required three warnings. About 70 people were arrested over the course of the week. But Friday morning was different. And because of the successful lock box action and total blockade, it was different in a way none of the BXE organizers had even thought about. Friday was the day for additional fracktivists and extractivists from the severely fracked-up state of Pennsylvania to join BXE. 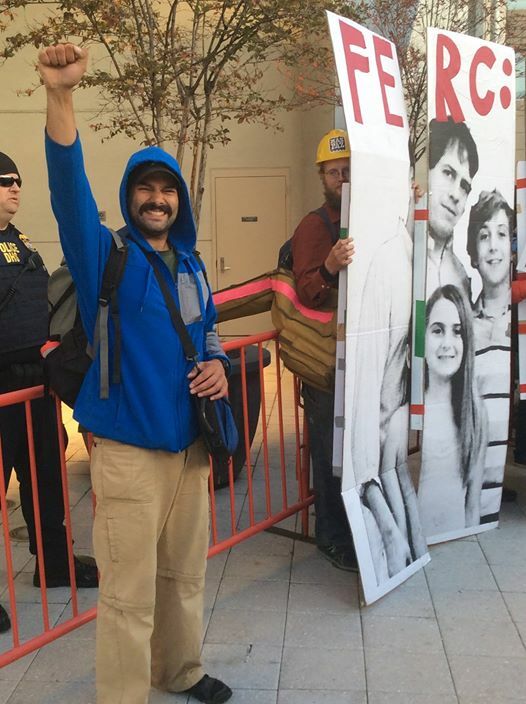 So as those 150 FERC employees waited to get into the building, we organized a teach-in on the front sidewalk, right in the midst of the employees. For fifteen or twenty minutes people like Maggie Henry and Veronica Coptis spoke from the heart, shedding tears but fighting through them, to let the silent and listening FERC employees know the human toll that their support of the gas rush has caused. There were no catcalls, no boos, no one publicly questioning the truth of what was being said. 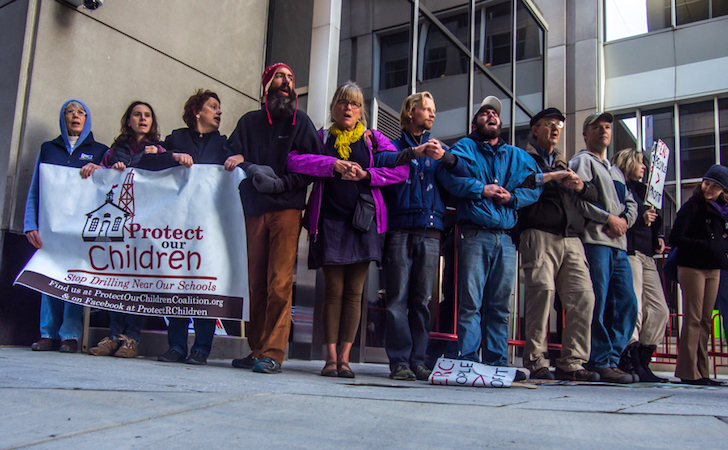 “We apologize for any disruption to your work day, but that’s what we’re here for—to disrupt the workings of FERC, which continues to approve gas infrastructure projects that threaten the health and quality of life for millions of Americans and the whole planet through increased greenhouse gas emissions. We found surprisingly little hostility from the close to 2,000 people we distributed our flyers to. 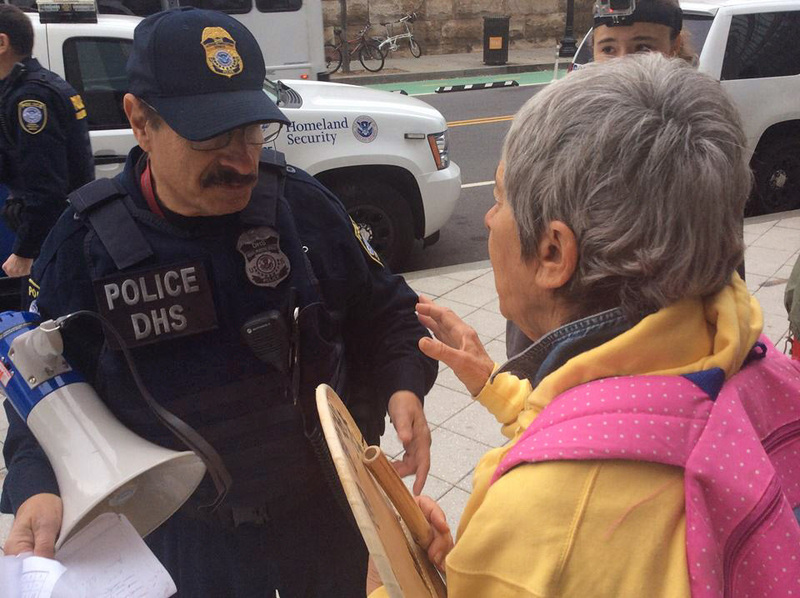 We even found, to our surprise, indications of support from some of the Federal Protective Services and DC Metro police who were doing their best to keep FERC open despite our blockading. Going into the week, our lawyer had said to us that he expected that they would get more aggressive as the week went by, but that turned out, in general and with exceptions, not to be the case. Exceptions included a couple of people tasered on Friday after we heard talk of it earlier in the week, several people falsely charged with “assault” for standing their nonviolent ground as part of a blockade and some police assistance to a small number of aggressive FERC employees who tried to push through us. Central to the success of this action were the sisters and brothers from the Great March for Climate Action who were there for all, or most, of the week. The decision to do this action during election week had a lot to do with the plan of the Great March to arrive in DC on November 1, ending on that day their eight month walk across the United States. Many of us not part of that march were impressed by the depth of commitment and soulful strength and organizing smarts they collectively brought to the November 1-7 week. We received more than a little bit of criticism about our decision to do this week during election week, and we understood why. We were not doing this to make a statement about how messed up our electoral system is and that people should forget voting—not at all. In our call to action we said, right up at the top, “vote we must, but we must also do more.” If the Great March had not been arriving on November 1 we probably would have moved things back a week or two. But as it turns out, it was very timely that Beyond Extreme Energy did happen during election week, during a week when the Republicans took back the Senate and Democrats generally did pretty badly—in large part because of the willingness of far too many, once again, to be Republicans-lite. It is time, in 2015 and 2016, for many, many more of us to “vote” with our whole lives through massive, serious, strategic nonviolent direct action campaigns that are as coordinated as we can make them. Investors in the fossil fuel industry, Democrats and others who want our votes, members of the mass media and the American people generally need to get it that the climate justice movement, increasingly aligned with other movements for progressive social change, refuses to accept “all of the above” and “business as usual.” We know what time it is—there is little time left—and we are the leaders we have been waiting for. Now must be, has to be, our time to rise up in large numbers and with a spirit of love, a nonviolent discipline and a willingness to sacrifice that cannot be ignored.